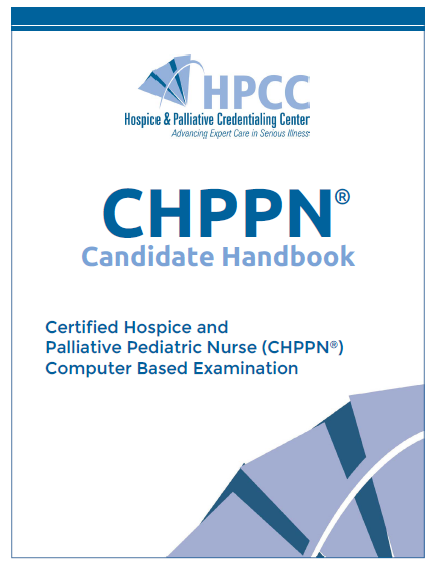 The Certified Hospice and Palliative Pediatric Nurse (CHPPN®) examination was designed for experienced hospice and palliative pediatric registered nurses. To be eligible, the applicant must fulfill the following requirements by the application deadline. To be eligible for the HPCC CHPPN® examination, an applicant must hold a current, unrestricted registered nurse license in the United States, its territories, or the equivalent in Canada. They also must have hospice and palliative pediatric nursing practice of 500 hours in the most recent 12 months or 1,000 hours in the most recent 24 months prior to applying for the examination. Applicant provides personal data and choice of specialty exam on application form housed on a secure AMP website (Please provide your HOME address on your online application as ADDRESS 1) by the online application deadline date. Any application without transcripts will be considered incomplete and you will not be able to schedule your exam. Recertification for the CHPPN® certificant is through Hospice and Palliative Accrual for Recertification (HPAR), which requires fulfilling practice hour requirements and accumulating 100 points over the preceding four years through various professional development activities. Points can be accrued through continuing education, academic education, professional publications, professional presentations, precepting students, orienting staff, and volunteer service in professional organizations. Each category varies as to how the points are calculated and how many of the total points can be obtained, but each activity MUST correlate with the test content outline as published in the CHPPN® candidate handbook. The HPAR packets are updated yearly, so be sure that using the current packet for CHPPN® (dated in the bottom left corner) which corresponds to the year that your recertification is due. The packet contains the instructions, test content outline, application, category logs, and summary log with fee structure and deadlines. Those renewing their CHPPN® credential should use these packets as their guide, and not use the online HPAR options for ACHPN® and CHPN®. If you have any questions please contact the national office at 412-787-1057 or via email at hpcc@gohpcc.org.